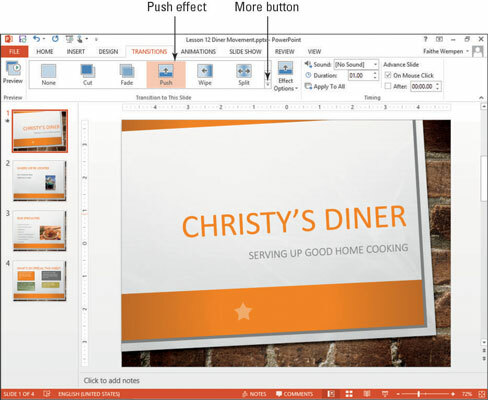 Transitions in PowerPoint 2013 are movements from one slide to another. The default transition effect is None, which means the slide simply goes away and the next one appears. Some of the alternatives include Fade, Push, Wipe, Split, and Cut, to name only a few. Each transition has default settings, so you can apply a basic transition effect with just a few clicks. You can then optionally fine-tune those settings later. Open a presentation that already contains slides. You will be able to add transitions to it. 2Select slide 1 and then, on the Transitions tab, select the Push effect. If you see the Push effect in the Transition to This Slide group, as shown in this figure, click it. 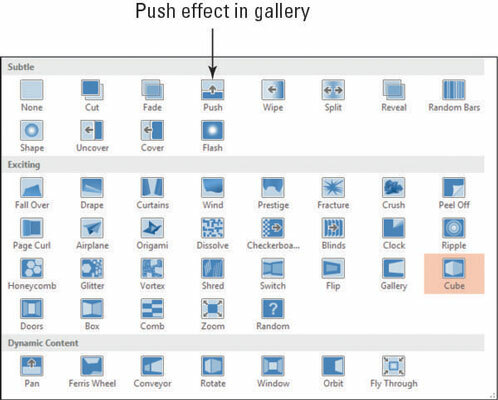 Otherwise, click the More button to open a gallery of transition effects and then click Push. 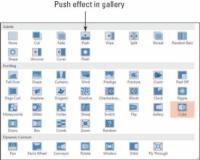 The Push effect is selected and is previewed on the slide. Notice that a star symbol appears below slide 1 now. This star indicates that a transition or an animation is associated with the slide. 3Select slide 2 and then select the Wipe effect. On the Transitions tab, if you see the Wipe effect in the Transition to This Slide group, click it. Otherwise, click the More button to open a gallery of transition effects and then click Wipe. 4Select slide 3, click More on the Transitions tab, and then click the Cube effect. This allows you to see different effects. 5On the Slide Show tab, click the From Beginning button. You can watch the show and preview your transitions. 6Click to move through the slides. When you reach the end of the slide show, click again to return to Normal view. 7Click slide 3 to select it. In this example, you are going to choose Cube. 8Click the Transitions tab and then the Apply to All button. 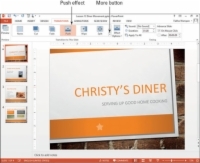 The transition effect from slide 3 (Cube) is now applied to all the slides in the presentation. Using Apply to All is much faster and easier than applying the same transition effect manually to multiple slides. If you don’t want it to affect certain slides, you can remove the transition from those slides later by choosing None as the transition effect for them. 9Repeat Steps 5 and 6 to view the presentation. You can check the transitions again before finishing.